Australia's wellbeing and prosperity is strongly linked to the ocean, with most of us living in highly urbanised centres along a narrow coastal strip. Decision making around sea level rise, storms and extreme events, shipping and maritime operations, fisheries and aquaculture, and marine park zoning must be informed by an understanding of coastal ocean processes, their drivers, and ecosystem responses. This requires both coastal and open ocean observations. The Integrated Marine Observing System (IMOS) is funded by the Australian Government to deliver datastreams from the oceans around Australia to support marine and climate research. IMOS has successfully deployed a range of state-of-the-art observing equipment, making all of the data freely and openly available through the IMOS Ocean Portal. It has overcome historical fragmentation in Australian marine and climate science by bringing multiple institutions together and shifting the paradigm to open data access for all. IMOS is guided by a series of science Nodes - an open ocean Node, and five regional Nodes that cover Australia's continental shelf and coastal oceans. These Nodes provide focal points for the marine and climate community and stakeholders to come together and identify science priorities and observational requirements. The observations are delivered by a suite of technology-based Facilities, operated by multiple institutions from across the nation. There are ten Facilities that collect the observations and deliver the data required to meet the scientific objectives of the Nodes. Eight of the ten Facilities operate in the coastal zone. As IMOS moves closer towards to the coast, coordination of observations becomes more complex, with the jurisdictions and observational requirements of federal, state, and local government agencies to consider, many of whom are undertaking monitoring activities. Additional value has been created by using the IMOS information infrastructure to develop an Australian Ocean Data Network, or AODN. which enables discovery, access, use and reuse of a much wider range of marine and coastal data. A more structured relationship has also been established between the national marine observing system, and coastal and ocean modelling activity. 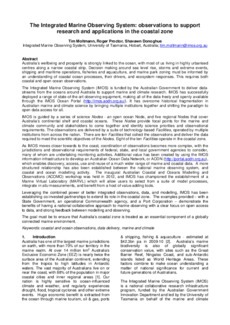 The inaugural Australian Coastal and Oceans Modelling and Observations (ACOMO) workshop was held in 2012, and IMOS has championed the establishment of a Marine Virtual Laboratory (MARVL) which will allow users to select from a suite of model processes, integrate in situ measurements, and benefit from a host of value-adding tools. Leveraging the combined power of better integrated observations, data, and modelling, IMOS has been establishing co-invested partnerships to extend its role in the coastal zone. The examples provided - with a State Government, an operational Commonwealth agency, and a Port Corporation - demonstrate the benefits of having a national collaborative approach to marine observing with a clear focus on open access to data, and strong feedback between modelling and observing. The goal must be to ensure that Australia's coastal zone is treated as an essential component of a globally connected marine environment.